This badge was issued to Marcin Hanasiewicz on 22 Nov 2018. 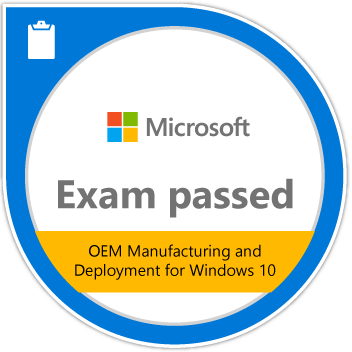 Passing Exam 735: OEM Manufacturing and Deployment for Windows 10 validates the skills and knowledge required to use the Windows Assessment and Deployment Kit (Windows ADK) to manage and deploy Windows 10. Candidates install or assemble hardware with genuine preinstalled Windows 10 and create complete images for deployment to customer devices such as desktops, laptops, and tablets.